Jenn McKinlay & Annette Mahon at The Poisoned Pen! 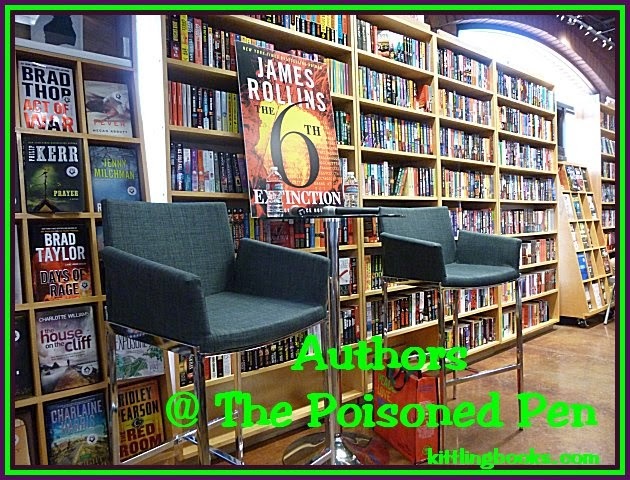 When Jenn McKinlay appears at The Poisoned Pen, I always know to head over there early so I can get my preferred seat. There was even more reason to be timely Saturday, November 8, because another local author, Annette Mahon, would be sharing the spotlight with her. When I arrived, I had to learn the area side streets a little better, since part of The Poisoned Pen parking lot was roped off, but that was a momentary blip on the radar, and I was soon in the store making my purchase, reserving my seat, and sitting down at the back to talk with Jenn from Tucson-- another McKinlay fan. In this day and age, it's a fact of life that almost all authors have to do their own PR work. If I were an author instead of a reader, I'm not sure if I'd welcome the interruption so that I could connect with my fans, or if I'd begrudge the time away from my writing. (It could easily go either way with me!) 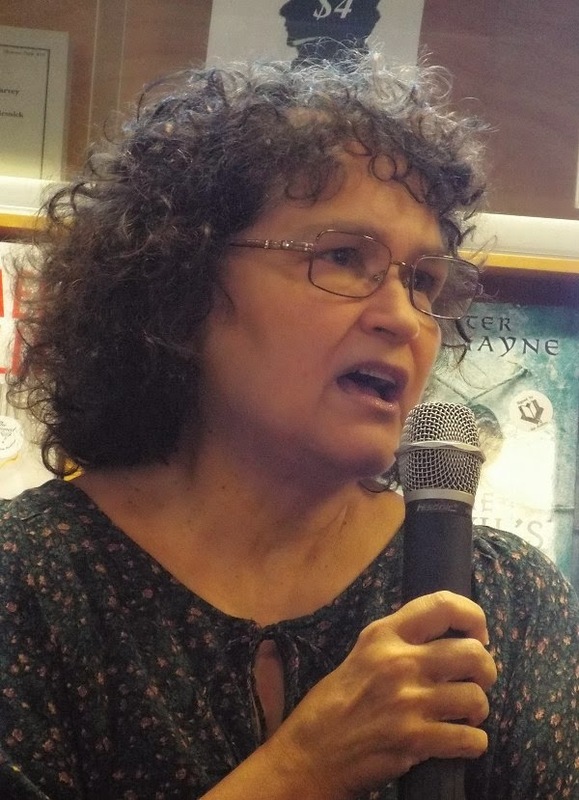 Annette Mahon, author of the St. Rose Quilting Bee mystery series set in Scottsdale, was at the bookstore early, which enabled her to speak with everyone there. She's the dark-haired lady standing in the center of the photo above-- and there's another author in the photo, too. Take a closer look at the lady standing way in the back... purple blouse, long blonde hair. See her? That's Lea Wait, author of the Maggie Summer mystery series set in Maine. 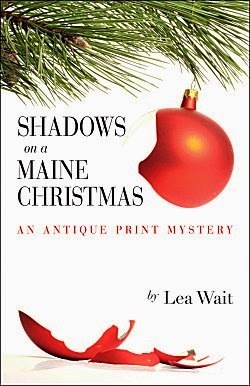 Antique print dealer Maggie Summer is in Maine to celebrate Christmas with her beloved Will Brewer and his Great Aunt Nellie, who has also gathered together her group of lifelong friends. One of Nellie's friends has dementia and begins referring to long-buried secrets from their youth-- secrets that could relate to an old crime, blackmail and murder-- and wind up putting all their lives in danger. 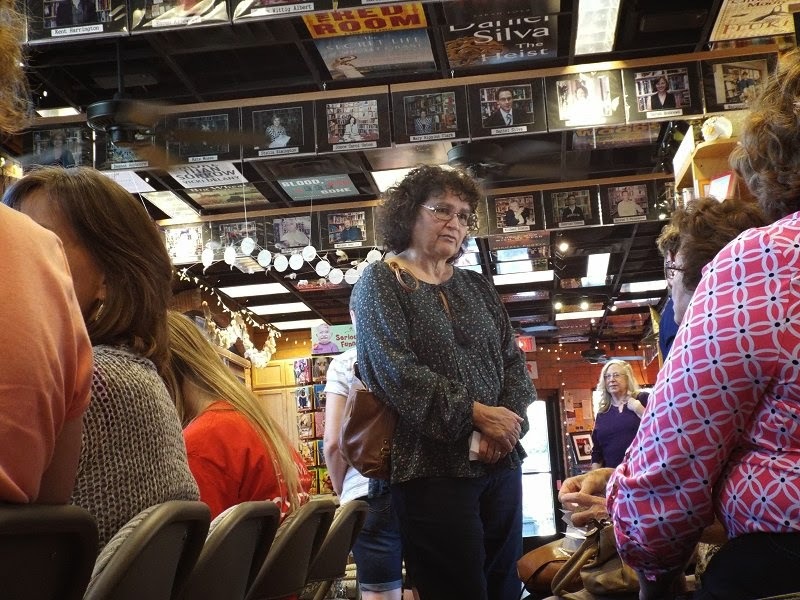 As Lea gave that brief description of her book, you could see the interest come to life in many of the faces in the bookstore. "How much can I say without giving something away?" Originally from Hawaii, Annette Mahon writes romances set in that state as well as her St. Rose Quilting Bee mysteries which are set in Scottsdale, Arizona. When she's not writing, she's working on her quilts, preferring the Hawaiian and Baltimore Album styles. 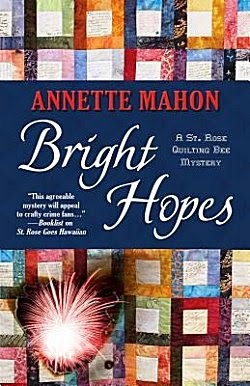 Her latest mystery, Bright Hopes, was inspired by something she heard on the news. It's July. It's hot, and people in Scottsdale are having their sleep ruined by a series of very loud explosions. The explosions become serious when main character Maggie's police officer son is injured by one of them. Yet another explosion collapses a roof and kills a church member. Most of the members of the St. Rose Quilting Bee think bored teenagers are playing with fireworks, but one of them is convinced terrorists are at fault. That opinion garners a lot of laughs until a bomb at a power substation abruptly pitches them all in the dark. Then terrorism doesn't seem so silly an option. 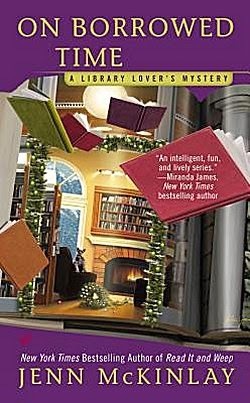 Author Jenn McKinlay was launching her latest Library Lovers mystery, On Borrowed Time. "I always have trouble knowing what to say without giving something away," McKinlay admitted, "but I do know that I can tell you what inspired the book. I was driving along in my car listening to NPR which was talking about coffee rust in Brazil. "Now, I love coffee, so this rust blight is problematic for me. My character Lindsey has had a brother Jack since the series began, but he's only been mentioned; he's never been around. Jack is an economist who travels around the world fixing businesses, and I thought, 'What if he's dealing with this coffee thing?'" Jack is loosely based on one of Jenn's cousins, who was available for the occasional phone call to answer questions. When asked, Jenn said, "I get most of my ideas from the news and from stories that people tell me." Annette agreed. "I get most of my ideas from the news, too. I always rework the actual event, and I make up a lot of the details. That's the fun part. I have been known to begin writing a story and then change the identity of the killer because my original idea didn't fit with the way the story was going." Both authors were then asked about their writing styles. Jenn replied, "I start out writing a ten-page outline for each book, and I've learned from experience not to deviate from it. The outlines are crucial because I write four different series. Before those outlines, it was easy for me to mess up and put the wrong characters in the wrong books!" Annette Mahon, on the other hand, didn't hesitate to declare "I'm a seat of the pants style of writer who doesn't use outlines!" These two have also had some of their ideas given the thumbs down treatment by their editors, with Jenn telling us that she'd wanted to have a teenage killer in one of her books, but she was told that that was a big no-no in the world of cozy, or traditional, mysteries. Annette works with a small publisher to whom she sends a completed manuscript. In the normal sequence of events, this means that she has a new book out every other year; however, things changed a bit this time around, and she'll have another new book out next October-- a Christmas mystery inspired by another news article. 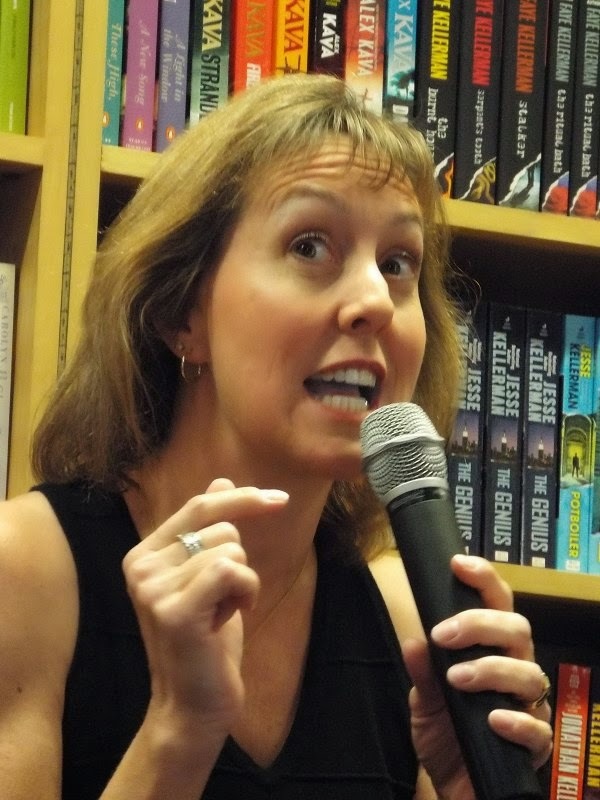 Most of her books are set in Scottsdale, Arizona, except for the fourth, St. Rose Goes Hawaiian. When Mahon was allowed to see the chosen cover art, it was obvious that her publishers didn't know a thing about Hawaiian quilting, and she had to have it changed. For her newest book, she submitted a photo she'd taken of the quilt she made for her daughter's wedding. Her publisher asked her to take a higher quality photo, and that was used for the cover of Bright Hopes, although it's blurred just enough so we can't read the messages in each square. Mahon makes a quilt for each of her books, and now it sounds like she'll be doing her own cover art as well! When asked what advice she would give aspiring writers in the audience, Annette said, "One: Read widely. Two: Never give up! One of Tony Hillerman's first novels was rejected with the comment 'This would be a pretty good book if you take out all the Indians.'" Jenn nodded in agreement as Mahon advised us to never give up. 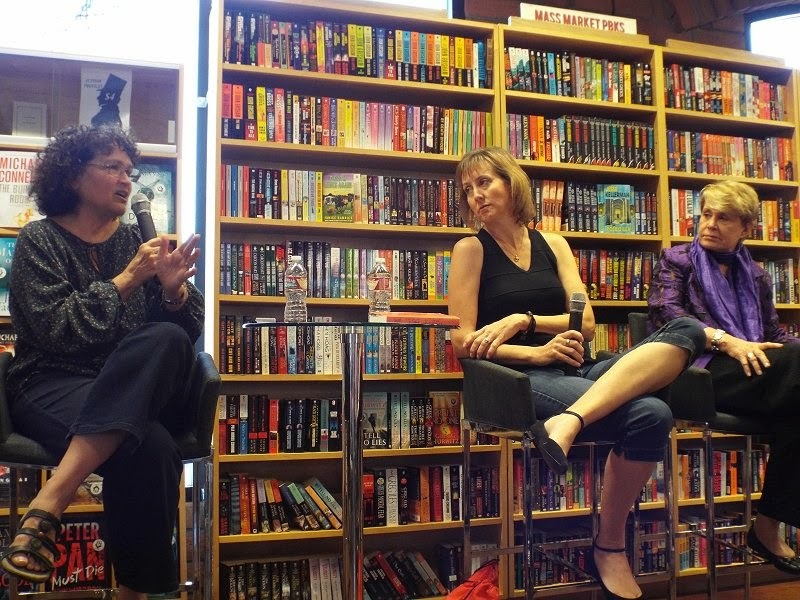 "The first time I met Charlaine Harris, she told me that her editor absolutely hated the first Sookie Stackhouse book and refused to send it out. 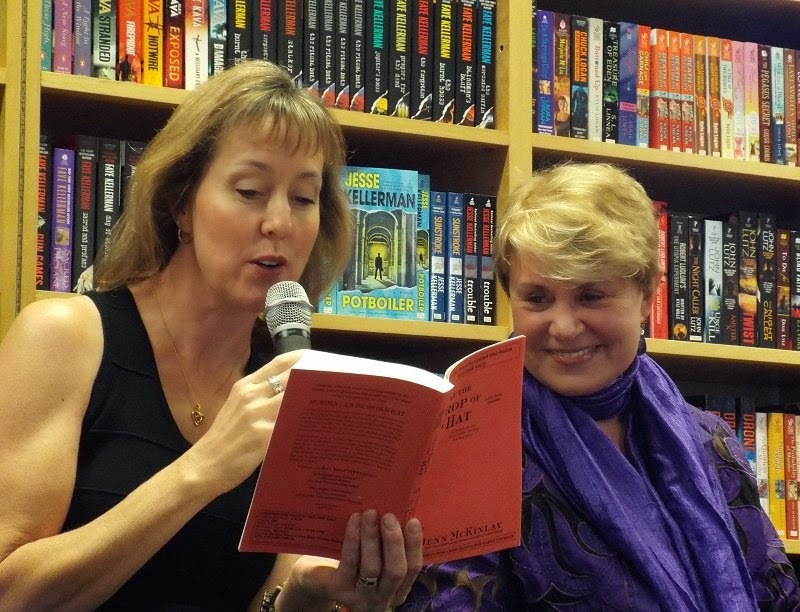 Charlaine insisted that, if she could find one person who read the book and liked it, the editor would send it out. Guess who won?" Jenn also mentioned spending eleven weeks at the Scottsdale Police Academy where she learned all sorts of things. She had originally wanted to attend the Phoenix Police Academy, but their scheduling for classes was too hit-or-miss for this very busy wife/mom/author. The women were then asked how they get answers to their questions as they're writing. Jenn has a wide circle of acquaintances in all walks of life that she can phone up and ask, and Annette said, "The Paradise Public Service Officer is great about answering all my questions. I've also learned that the Yahoo Group for Crime Scene Writers is a good place to find answers-- especially since I didn't feel comfortable researching bombs online at home!" Finally free from her luncheon engagement, Barbara Peters appeared on the scene, and the two authors shared some of their special Poisoned Pen memories. One of Jenn McKinlay's was the fact that her two sons had purchased all their Harry Potter books there at the bookstore. For Annette Mahon, her special moment came in 1994 when she ran in to tell Peters that she'd sold her first book. Jenn then told us that there would be a party at The Poisoned Pen on Valentine's Day next year for the release of her next Hat Shop mystery, At the Drop of a Hat. Plans are being made to make it a very special event. Then McKinlay pulled out an Advance Reading Copy of At the Drop of a Hat and proceeded to read the dedication aloud to Barbara. Jenn McKinlay reading her dedication to Barbara Peters. Jenn's next Hat Shop book is dedicated to Barbara Peters and the staff of The Poisoned Pen. You could tell how pleased Barbara was, and she made us all laugh by telling us that we could buy a copy of the book, have Jenn sign it, and then approach random Poisoned Pen staffers to add their own signatures as well. Sounds like a plan to me! After that emotional scene, things settled down a bit while Barbara told us that she was mulling over adding some non-book release events to the bookstore's calendar from October to April-- some probably in the daytime. You folks out there who live in snow country may not realize this, but October to April is our High Season here with lots and lots of visitors-- and not all the accompanying wives, girlfriends or daughters want to follow their menfolk around for every round of golf or spring training baseball game. I'm going to be very interested in seeing what Barbara and her staff come up with! Barbara did say that one of the ideas she's kicking around is afternoon tea-- and then she eyed Jenn in her black denim capris and said, "I'm convinced Jenn's so thin because of all the series she writes. When does she have time to eat?" One of the last questions asked was about how each writer got her manuscript ready to send in to the publisher. Annette said, "I read my book aloud before sending it in to check for word repetition and to make sure that the dialogue works." Jenn, who has such an expressive face, shrugged and said, "I read mine once. That's it. I don't think I could write just one book a year. The temptation to edit would be too great, and I'd wind up editing out everything that's good!" We then heard from Barbara Peters, the editor. She'd recently been talking with a poet who's written two books. One book was filled with so much technical stuff that it was-- frankly-- boring, but the second book had promise. What she thought would work is to combine the two books-- use bits and pieces of the technical things to enhance the story in the second book. The author listened to what Peters had to say, and he was okay with those changes. Peters was surprised and pleased that he had such a professional attitude about his writing. "I may not have understood all his writing, but I do understand crime fiction!" Oh yes. Barbara Peters does indeed know crime fiction, and I am one of the many people who are reaping untold benefits from her knowledge and expertise! If it weren't for this woman making up her mind that she wanted to open a bookstore, I wouldn't be walking in The Poisoned Pen to buy wonderful books, have great conversations with staff and authors, and be asked where Denis is. Bookstores are slices of paradise here on earth, aren't they? Cathy - Yes, they sure are! And it all sounds like another great evening at the PP. And what a great idea to dedicate a book to the shop and the staff. I thought it was a wonderful idea, too, Margot! Cathy, I love this post. Because of your recommendation years ago, I get the Poisoned Pens' newsletters which are super good for mystery fans. I'm always envious of the authors who come to visit so I appreciate this post. It felt like I was there. Yes. It does feel like one was right at the PP listening to those authors and the CEO of the bookshop. And, true, bookstores -- and sometimes libraries -- are like heaven on earth. But the line that Tony Hillerman was told he should take all of the Indians out of his book! What the heck were they smoking? Unbelievable. I don't know what that idiot was smoking, but I certainly don't want any! Thank the stars above that Hillerman paid no attention! Very interesting blog. I already enjoy Annette Mahon's books and shall look out for the other authors. Thank you so much for stopping by, Anna! Thank you for the lovely recap, Cathy. I enjoyed reading it. And your photos are great. Oh, thank you, Annette! It means a great deal to me that you liked it.